This morning the IMSA Lites series completed its second race of the weekend for Round 8 of the championship supporting the American LeMans Series. My B-K Motorsports team did yet another fine job of preparing a great Elan DP-02 race car. This time we raced in dry conditions, allowing for a tighter race and closer competition. I was really interested in raising my game further this morning. Although we had a great race yesterday, in our quest for continuing improvement, I thought I could have done a better job keeping my head focused and relaxed. My coach Christian Boudon shared his wisdom to make sure I would be ready. Thankfully, I was more relaxed as race time came. At the green all I wanted to do was drive the best cold-tires first lap I've ever driven in my life. I can't be sure if it was all that, but it was pretty close. I had about a 1 second gap at the end of the first lap. Once the gap was up to about 2 seconds, it stabilized. I knew our prime competition, Jay Cochran, would improve as the race went on. I saw his pace increase, so I knew there was another lesson there for me. I had to raise my game again. I could not let him think for a minute he had a chance to catch me. My pace wasn't enough. I began another track analysis. I found that I was too conservative in Turn 1 and 2, too late at turn in for Turn 3 and Turn 10, and too conservative in general at Turn 8. Within five laps I had corrected these issues and dropped my lap times about a half second. I was on my game. Then another challenge. I was a little concerned that I was breathing a little fast, feeling a little tense in the arms. Had my preparation not gone as well as I thought it did? Ah, but this was just the normal workout first wind. We've all been there, haven't we? We go for a long bike ride or run, and those first fifteen minutes we wonder how the heck we're going to make it for two hours? In that instant, I lost all worry. Within a few more laps my arms relaxed, my eyes calmed, and my breathing slowed. My lines smoothed, my throttle became more controlled. My times dropped another two tenths. Then with two laps to go, another four tenths! I was at 1:19.209, about 0.005 second faster than my qualifying lap. This was pretty cool! With one lap to go I saw a huge cloud of smoke on the back straight and the flaggers waiving the telltale debris flag. With that flag and smoke, I knew there was danger ahead, likely oil on the track. I entered Turn 8 at around 145 mph, began to slow, and there it was, a long streak of oil on the track. What was I to do now? And by the time I had begun that thought, I was sideways, looking at a car in the gravel, looking at another car stopped on track with a trail of perfectly crossing skid marks that showed the speed and duration of his spin, and looking then to my only escape path to his right. Mercifully, a cleaner bit of asphalt went underneath my tires, and I was pointing where I wanted to go. I lost only about 1.5 seconds, and I was across the finish line at the checker moments later. Steve Levinsohn and Thomas Unger did a fantastic job taking care of me this weekend. 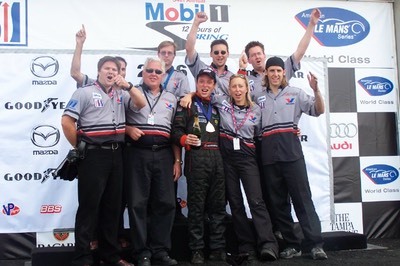 Rick Cameron was a great help with our car development. James Cape was a major help with his HelixUS.com video service. Matthew Maxey assisted us well with our data grunt work. Bob Bach gave us the tools and support we needed, and most importantly, his faith. I sincerely appreciate everyone's effort at B-K Motorsports, especially the support of Mazda, and two of its hardest working guys, John Doonan and Robert Davis. I can't say enough about the sponsors and investors who have given me the "college tuition" needed to get this far. Skip Barber, Cornerstone Controls, SRS, Automatic, Helix, Carmela, BMS Group, Andersen Racing Team, the secret donors, and of course my family and friends. Thanks guys. Our next two races are at Road Atlanta on September 4-5. Stay tuned for more! 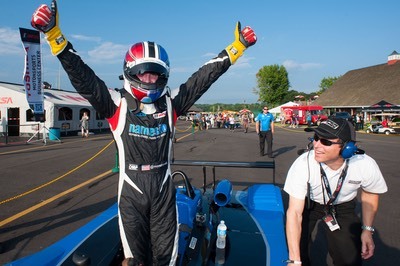 Win for Round 7 at Mosport! Today's IMSA Lites race at Mosport International Raceway came under my favorite racing conditions. Rain!! We had been planning on a dry race as the skies had begun to clear in the morning. Thankfully (for us anyway) another storm came through and put a light layer of water on the track. At the start everyone was calm and collected into Turn 1. I found the gap I needed to pull ahead. It was really fun to explore yet another track. 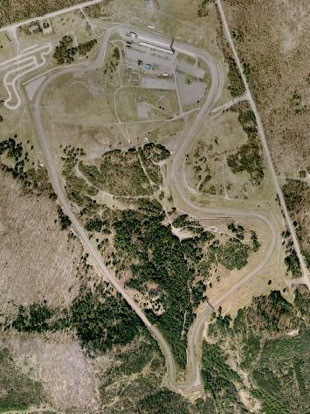 I don't mean to explore Mosport necessarily, but to explore a new track condition. It's one of the things we teach in the Skip Barber National series. We talk often about doing a proper track evaluation as a race begins. In this case, the track had become greasy, no doubt due in part to the other race series competing here leaving behind generous portions of oil and rubber of varying compounds and chemical compositions. Now that the track was super greasy and wet, I had to learn a few new lines through the turns. I had to learn to squeeze the power just a little more smoothly in places. I had to adjust entry speeds into all the faster corners, while leaving speeds in the slower corners about the same. As the race progressed, the track improved slightly, calling for more changes to the line and speeds. It was a great study session. Heck, it was just fun! We led the whole race, start to finish. There were two caution periods that gave me a little time to look at the fans, especially in Turn 3. At this corner the fans were not only cooking up a serious BBQ, but were also not ashamed that their BBQ smoke was crossing the track. It was hard to ignore the smell of freshly cooked food each time we came through that turn. Most of you know how much I love food! Nevertheless, it was a day for a win. Thanks again to Steve Levinsohn and Thomas Unger for working hard all day to make this happen. I really appreciate this B-K Motorsports team. Thanks as well to Christian Boudon who continues to coach me to be far more than I ever imagined I could be. 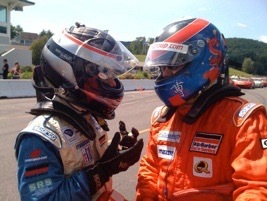 It was a great day for other Skip Barber drivers. Alexander Rossi won today's Formula BMW race in the rain. Julia Landauer, who has had a very difficult year in Formula BMW, finished 5th in the rain, her best finish of the season. 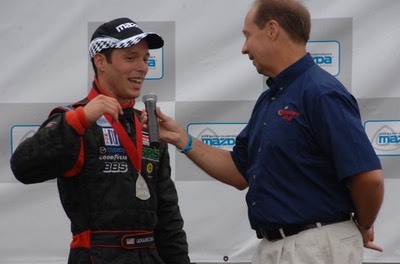 Jonathan Goring was the fastest driver in today's Star Mazda race, also in the rain, but during his green-flag pit stop to change to rain tires, he was snagged for speeding in the pit lane. A real tough break, but he still finished 8th after taking his penalty, going a lap down, then unlapping himself! A fantastic effort! We have one more IMSA Lites race tomorrow morning, at 9:05 AM Eastern time. If you'd like, you can watch it online on Live Timing and Scoring using the link on the home page of www.gerardobonilla.com. Life is good these days. Many great efforts are coming to great results. I have so much to be thankful for, and so many people to be thankful to. Many of you. In recent weeks new opportunities have opened, and as you can imagine, I'm putting my best efforts to see where those opportunities might go. For now, the B-K Motorsports team has brought me Mosport International Raceway in Ontario, Canada for races 7 and 8 of the IMSA Lites series. Mosport is a classic race track, filled with very fast corners and for the new guys, lots of fear! There's not too much of that in my cockpit (close your eyes Mom), so we're moving along well. Two of the toughest corners are in 5th gear, one is in 6th. It's serious fun. We completed our final practice this morning on a wet race track. It's hard to put into words how incredible the Hankook rain tire is. At the risk of sounding like an advertisement, it has a nice combination of tread slots and soft compound rubber that gives me a ton of confidence. For those of you who have raced in the rain, imagine a tire you can drive on the dry line! This is it. Our lap times in the wet were only about nine seconds off our dry time later in the day! So much fun! We ended up P1 by 4 seconds. In the afternoon Qualifying, the track was dry, and new tires were fitted. Immediately traffic was an issue, as I found myself behind our toughest competition. I was considering passing, but why would I want to show him the line and speed I use? That wasn't going to happen. I pitted for some space and then returned to the track to get to work. I put in a 1:19.7 and came back to the pits. The team felt I was relatively safe, but we were only up by a half second, the closest anyone has been all week. I returned to the track with only enough time to do two laps. First lap, 1:19.7. Second lap 1:19.2. I guess we'll be safe after all. We ended up with Pole by one second. I can't say enough about the people at B-K Motorsports who keep producing fast, reliable cars for me to drive. Steve Levinsohn and Thomas Unger are my two main guys, always with greasy hands. We welcomed a new face, Matthew Maxey, who is helping the entire team with data acquisition. Thanks again to Bob Bach and his Mazda compatriots for giving us what we need to make the magic. There's a few others who added to my recent push, and I really appreciate it. Stay tuned for our first race of the weekend, Round 7 of the year, tomorrow at 12:50 PM Eastern time. 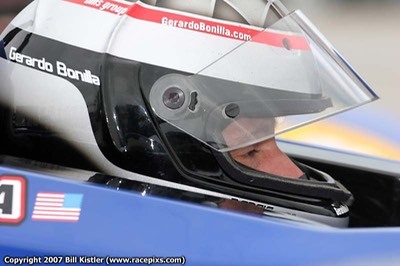 You can watch it on Live Timing and Scoring using the link on the home page of www.gerardobonilla.com. Our second race will be on Sunday at 9:05 AM Eastern time, also available on Live Timing online.